You agree with me I hope. Pink is hot and black and white make it hotter. Let's start with the cutest bag you ever did see. This precious Tory Burch bag is a little jewel isn't she? Get on the list and pre-order it. I have a feeling it will sell out fast. Oh and the cute shoes? I can't resist a sweet scallop and a bow. I have been eyeing (or eying if you prefer) this fabulous Art Deco mirror for a while now. I just really love its shape and design. And that cute lamp? I will admit it, it looks like candy. I almost want to lick it. Have a wonderful and pinktastic day. I agree - love pink white and black!!! I larve the pink!! So much! Oh my I love love that clutch. I have never been a Pink girl, except for hot intense fuschias, but I am loving these fun lipstick colors out these days.. The more saturated the color the better! 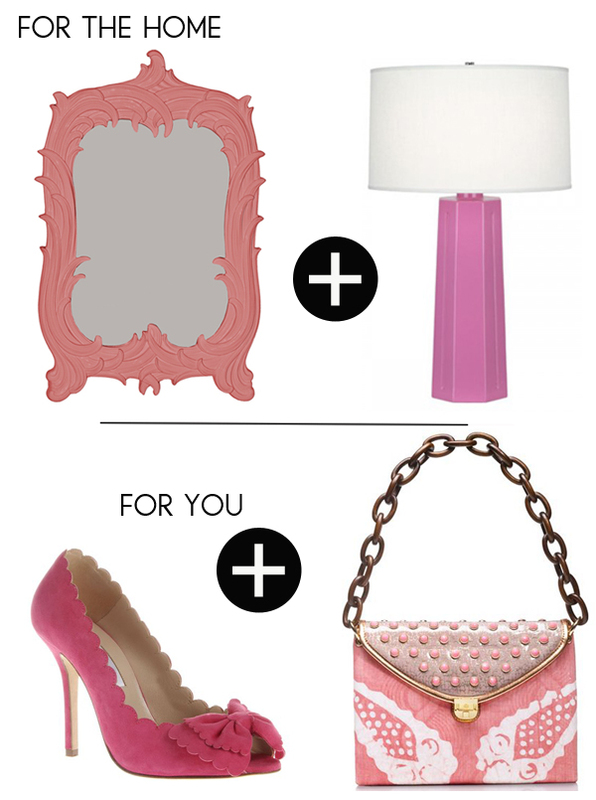 I've always loved pink :) That bag is amazing - I love the batik fabric and contrasting studs! I LOVE the first fashion image, wish I could see the whole outfit. 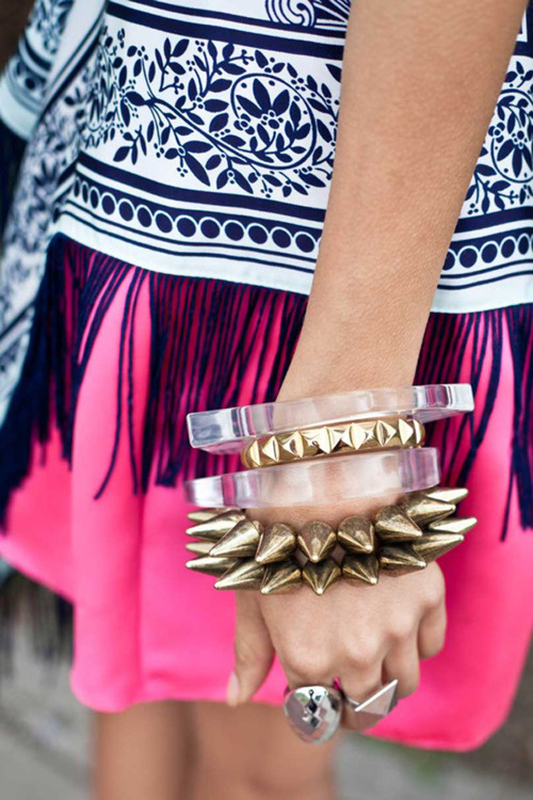 The b&w fringe top with hot pink skirt is TO DIE....but then she has gold spike and lucite arm candy. That's my kinda girl! UMMMM YES. I'll take them all. Pink, black, and white is always such a fab combo. Love all of these. Yes, I looove white, black and pink! That TB bag is insane, goooorgeous! that bag is perfection. i love pink and would definitely use more of it in my home if only the boy were ok with it ha. Yikes spikes! JK-love the precious/edgy combo. I must confess that I love pink!!! And it's true that with black it's more chic and glamorous! You know I LOVE pink. I'm actually getting ready to work some pink into my decor - a little nervous but I think it will be the perfect punch! Love it all! Especially the shoes and the bag. I'm with Alison, I would have never guessed the bag was from Tory Burch! Gorgeous! I'm dying over that first mirror...so fun! !